Exodus 23:1-9 (Part of the Everything I Needed to Know I Learned from Romans 12 series). Preached by Pastor Jon Truax on January 29, 2017 (Sunday Morning). Micah 6:6-8 (Part of the Everything I Needed to Know I Learned from Romans 12 series). Preached by Pastor Jon Truax on January 22, 2017 (Sunday Morning). Ecclesiastes 3:1-8 (Part of the Everything I Needed to Know I Learned from Romans 12 series). Preached by Pastor Jon Truax on January 15, 2017 (Sunday Morning). Exodus 18:13-27 (Part of the Everything I Needed to Know I Learned from Romans 12 series). Preached by Pastor Jon Truax on January 8, 2017 (Sunday Morning). Ezekiel 36:22-28 (Part of the Everything I Needed to Know I Learned from Romans 12 series). Preached by Pastor Jon Truax on January 1, 2017 (Sunday Morning). Preached by Josh Smith & Jon Truax on October 23, 2016 (Sunday Morning). Don't Keep Your Sins on Life Support! Romans 6:3-11 (Part of the Easter series). Preached by Pastor Jon Truax on April 5, 2015 (Sunday Morning). Romans 8:18-25 (Part of the Four Questions About Heaven series). Preached by Pastor Jon Truax on November 16, 2014 (Sunday Morning). Romans 3:9-20 (Part of the 2014 - Statement of Faith series). Preached by Pastor Jon Truax on March 9, 2014 (Sunday Morning). Romans 15:2-7 (Part of the Spiritual Gifts series). Preached by Pastor Jon Truax on November 4, 2012 (Sunday Morning). Romans 13:8-10 (Part of the Science Hill series). 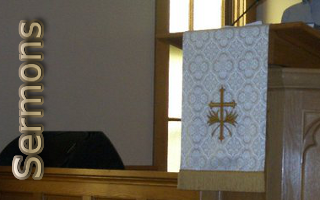 Preached by Pastor Jon Truax on February 27, 2011 (Ash Wednesday).